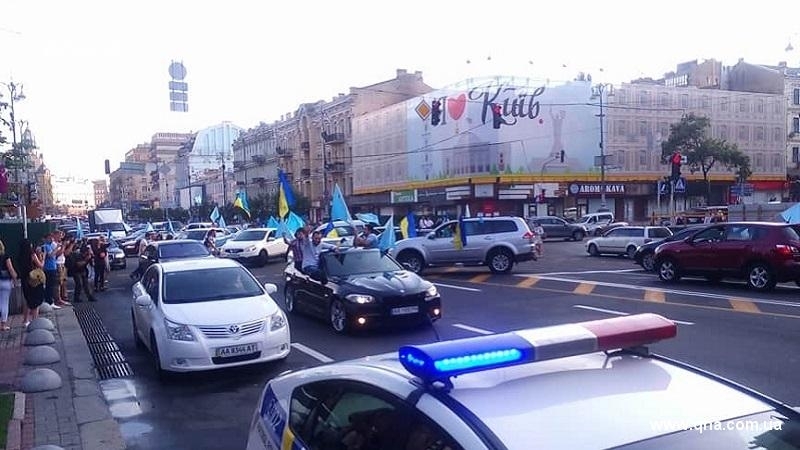 On the Day of the Crimean Tatar National Flag a symbolic procession was held in the center of the Ukrainian capital. The participants of the rally gathered at the crossroads of Bogdan Khmelnitsky and Khreshchatyk streets. Unfolding the main national relic of their people, the Crimean Tatars marched along Khreshchatyk to the Independence Square, the QHA correspondent reported. Among those who took part in the action were members of the Mejlis of the Crimean Tatar people, cultural figures, public activists and not indifferent residents of the capital of Ukraine. The participants of the procession were welcomed by the Head of the Mejlis of the Crimean Tatar people Refat Chubarov, members of the Mejlis Gayana Yuksel, Riza Shevkiev, Eskender Bariev, as well as Adviser to the Chairman of the Mejlis Ismet Yuksel and Mustafa Dzhemilev's wife Safinar Dzhemileva. About a hundred people participated in the march, all of them walked holding on to the flag. In their appeals, many speakers stressed that the flag is a symbol of today's struggle for the liberation of the Crimea. “The Crimean Tatar flag today is a symbol of invincibility and faith. It is due to the struggle of the Crimean Tatars that the national flag is recognized all over the world today," the Head of the Mejlis of the Crimean Tatar people Refat Chubarov said. Among the slogans were the traditional "Millet, Vatan, Kırım", as well as "Crimea is Ukraine" and "Freedom to the Kremlin’s prisoners". One of the new slogans was the question "Kimnin Kırım?”, to which the participants of the action answered in chorus: "Menim K ır ım!" (Which means "Whose is the Crimea? - Crimea is ours!"). For the first time the Day of the Crimean Tatar flag was celebrated in 2010. In the same year, on June 26, at the Fifth Kurultay a decision was taken to celebrate this day annually as the Day of the Crimean Tatar flag. Every year, on this day in the capital of the ARC Simferopol and other cities, solemn events were held with hundreds of participants. After the annexation of the Crimea by Russia, all events supported by the Mejlis of the Crimean Tatar people and Crimean Tatar communities take place in the mainland Ukraine.